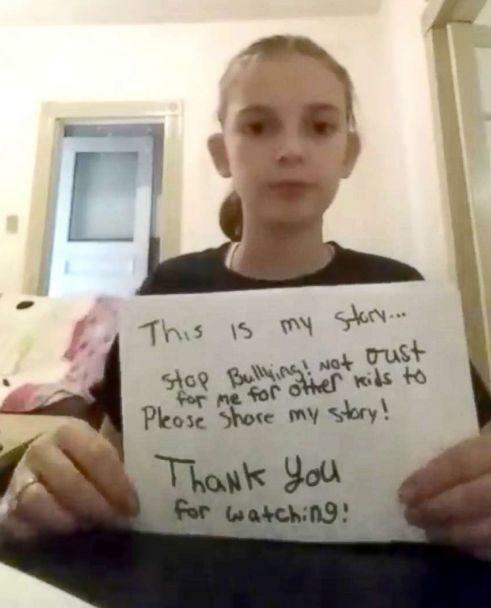 In an emotional video, a 10-year-old girl is making a public plea asking people to stop bullying one another. 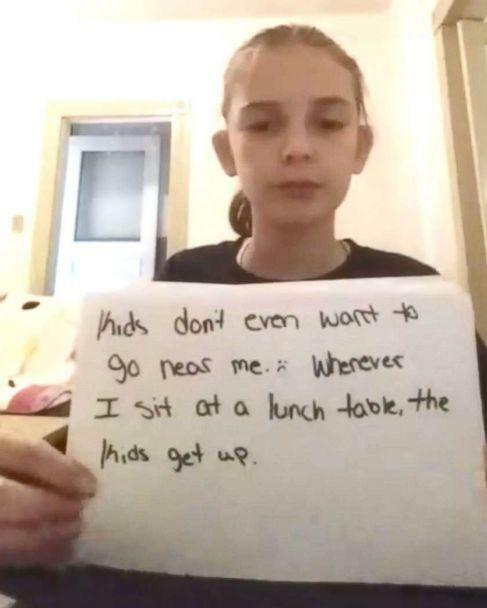 On April 4, Jenn Slater of Duryea, Pennsylvania, shared the video of her daughter, Cassidy, on her Facebook page. 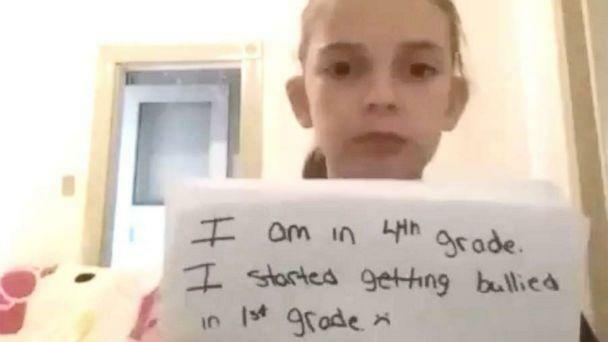 The fourth-grader appears in the selfie video holding signs up describing how she's been bullied since first grade. “One day during recess, a group of kids grabbed my purse off a teacher, and spit on it and me,” one sign read. Cassidy goes on to say that kids won't sit with her at lunch, she feels alone and has no one. Actor Hugh Jackman also shared Cassidy's video via ABC News' Facebook onto his own, verified Facebook account. "Hi Cassidy .... I’m Hugh," Jackman wrote. "I want you to know you’re loved, special & smart. You’re strong, funny & beautiful both inside and out. BULLYING IS NOT OK. Please never stop asking for help. You will find it from people and places you never thought possible. I’m your friend." Cassidy's father, James Warner told ABC News that he first saw the video after his daughter posted the original footage on her own Facebook page. "It just devastated me," said Warner, of Scranton, Pennsylvania. "I don't know how to explain how it made me feel...even talking about it I get choked up." The father of four said it started out as "kids being kids" with name-calling and "got worse" over the years. Warner said that he and Cassidy's mother have remained in close communication with the principal of her school and have previously discussed changing her lunch time, recess time and her classroom -- something she did not want to do. "At that point Cass was feeling like, 'I didn't do anything wrong. Why am I the one who has to change everything?'" Warner said he was unaware of how bad the bullying became this year until seeing Cassidy's video online, which was later taken down after it was anonymously reported by a Facebook user, Warner added. Warner said that on April 2, he met with the principal of Cassidy's school and the superintendent of the Scranton School District to discuss options to make her feel more comfortable at school as well as the buzz that surrounded the online video that she posted about her bullying experience. "I never once tried to put the blame on the school," Warner said. "The whole purpose was to let everybody see that these kids are not supposed to be feeling like this." The superintendent's office of the Scranton School District did not immediately respond to ABC News' request for comment. After Cassidy's video was taken down, her mother reposted it onto Facebook. "I will be my daughters voice I will share her story and I hope others will share too [sic]," Slater wrote. As for the attention Cassidy's video has sparked, Warner described it as "overwhelming." "Never in a million years did I think it would have this many shares and comments," he added. "Cass has been getting comments from all over the world and it's so much positive stuff. Words cant explain how grateful I am for it." Warner hopes Cassidy's video helps spark the conversation of bullying in households. "I hope parents will just sit down with their kids and talk to them," Warner said. "I didn't know it was that bad and that Cassidy was feeling how she was. Make sure [your children are] not being bullied or not bullying someone else."